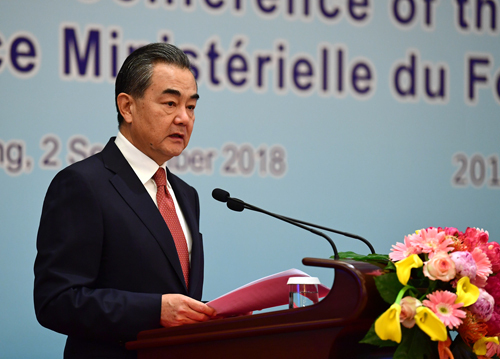 On September 2, 2018, when introducing the implementation situation of the outcomes of the Johannesburg Summit of the Forum on China-Africa Cooperation (FOCAC) at the 7th Ministerial Conference of the FOCAC, State Councilor and Foreign Minister Wang Yi pointed out that China and Africa have adhered to equality and mutual trust, and comprehensively improved political relations over the past three years. Wang Yi expressed that facing major development, great change and profound readjustment in today’s world, China-Africa high-level exchanges have become closer and political mutual trust has been continuously enhanced. Both sides firmly support each other in their respective development paths that conform to their own national conditions, firmly support each other's efforts to safeguard their sovereignty, security and development, fully accommodate each other's core interests and major concerns, and pay more attention to the exchange of experience in state governance and administration. Wang Yi pointed out that President Xi Jinping attaches great importance to the development of China-Africa relations. After taking office as Chinese President in 2013 and the election as Chinese President this year, President Xi Jinping chose Africa as the destination of his first overseas visit. In his first overseas visit this year, President Xi Jinping visited Senegal, Rwanda, South Africa and Mauritius. Since the convening of the Johannesburg Summit three years ago, President Xi Jinping has received 15 heads of state of African countries who visited China and met with dozens of heads of state of African countries. President Xi Jinping himself has established profound friendship with heads of state of various African countries. The principle of sincerity, real results, affinity and good faith and the values of friendship, justice and shared interests put forward by President Xi Jinping have been promoted as China’s overall policy philosophy and action guide towards developing countries. Wang Yi noted that over the past three years, 27 leaders of the Communist Party of China and state leaders have visited Africa, and 30 heads of state and leaders of government of Africa have visited China or attended meetings in China. Important visits between China and Africa cover all African members of the FOCAC. Chinese Foreign Minister adheres to a good tradition of visiting Africa as his first overseas visit every year. Over the past three years, I have visited 22 African countries in 8 times and received 33 foreign ministers’ visit to China. In September 2017, we successfully held the fourth Political Consultation between Chinese and African Foreign Ministers during the United Nations General Assembly in New York. Wang Yi pointed out that the big family of China-Africa friendship has been further expanded. China has resumed diplomatic relations with Gambia, Sao Tome and Principe and Burkina Faso in succession. At present, China has established diplomatic relations with 53 African countries and established various kinds of partnerships including the comprehensive strategic cooperative partnership with 24 African countries. The strategic dialogue and cooperation between China and the African Union as well as other regional and sub-regional organizations in Africa have also been strengthened.